As I have done for years now, I started the first day of the new semester with new students and with clay. It was great to share past Empty Bowls experiences with students and get their hands busy with making right away. I look forward to our event to raise food and funds for our local food bank later this Spring. I will post more details on that as we get closer to the date. One new thing I tried with my students this week was a scavenger hunt. 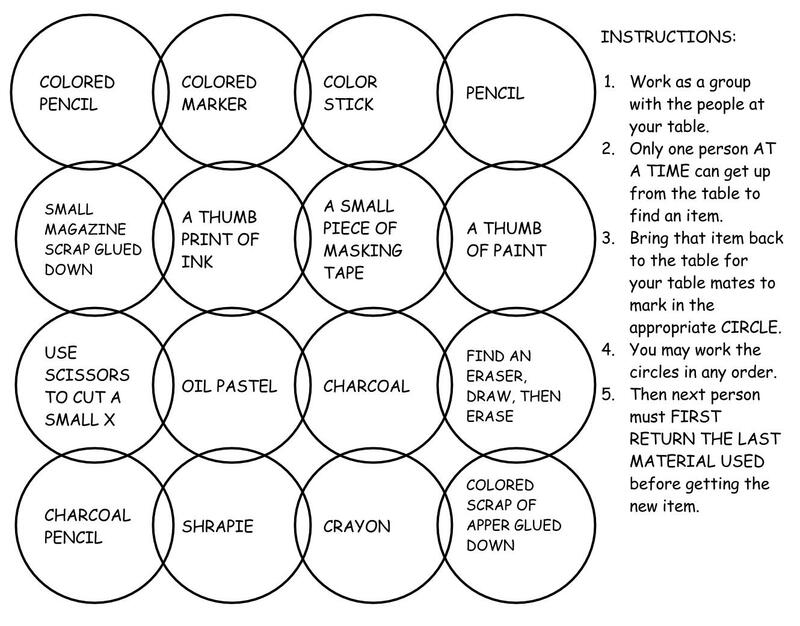 I was inspired by other art teachers out there who shared their ideas about getting students familiar with the room and materials through something like this and found this resource as a great help to doing it for my students. I of course adapted it to fit our needs and space, but it did not need much adjusting to work wonderfully in my classroom. I feel this activity really has allowed students to see themselves as a resource and to rely on their ability to work together in order to get things done. One of my favorite ways to start out the first week is to use Peter H. Reynolds' "The Dot" as a springboard for my students to get working with materials. And since we did the scavenger hunt, they knew exactly where all of the materials are kept! I have a three year plan for these spheres before I consider the project complete. Last year we made medium sized ones and this year we made smaller ones that were tiered on each other. Next year, I plan to make LARGE ones that will hang in the middle of the installation. Then I will need to move onto something else, I suppose. In order to make the sphere you need 20 circles that you fold into triangles. You then glue two sets of five as shown above and then a row of ten that makes up the middle. It is very quick and easy to put together and students are always impressed with how quickly the flat shapes morph into a a 3D form. Here are some finished pieces before they were folded and made into spheres. Oliver M.: The meaning of "The Dot" is about how she din't think she was good at art but truly deep down she had a determination/inspiration for art and how she thinks of it. I did my dot because I really like to make make landscapes. I hope to inspire other people to try out to make different types of art. Ella P.: The dot story means and shows that anyone can make anything and turn it into art, it connects to my dot that I made because I have been fascinated with Mandalas since I saw them. They have so many cool designs and shapes that make up this flower. Avery Z,: The dot story represents the will to try and not to worry about the outcome. This deeply affected what I put on my dot for this project. Spelled throughout the dot is the word 'try' to remind people to do their best and try. Marie B.: "The Dot" is a story about how you can use art and any type of talent to inspire others. This piece of artwork relates to "The Dot" story because it inspires people to live their life colorfully. As you might see the art piece represents a piano. Usually piano's black and white. Generally pretty boring. But by adding colors of the rainbow to the piece it shows that we can inspire people to add color to anything boring or bad in their life. Living a colorful life means to add happiness and interest to your own life. This has been an awesome semester with my High School students as we explored manual settings on a camera to create an array of images. From exploring shutter to aperture, DOF and painting with light, students really pushed their cameras to the limit to create images that explored a variety of ideas and concepts. For our last class, students shared a presentation that compared their work to the work of artists we studied in class and also presented their final series that explored a larger concept or theme of their choice using techniques explored in the previous assignments. We also finalized our Spring display in the Van Singel Fine Arts Center that showcases the BCPS k-12 program. In her series, Tara explored the transformative quality of these small plastic figurines when placed in various scenarios. Here are two examples from her series that capture the essence of the project. In Jason's series, he had a model pose with a yellow balloon acting as the face put on regardless of true feelings. Here are two from his collection. Holly used a song to inspire her final work of images. Each picture represented a part of the song, illustrating the lyrics through the use of light, shadow, and motion. Here are two examples. In her series, Denise went downtown and captured the city by night. Here are two of her pieces in the series of eight. Sarah worked with the theme of identity and addiction in her series of clouded visions of her model in various stages of being overwhelmed. Here are two from her series. In Kenton's work, he used friends and church members to highlight his love of music. Using an array of warm and cool tones in the work, Kenton also used color to express feelings he found in his subjects. Here are two from the series. I am so proud of their accomplishments and know they are going to lead creative lives that take them on all kinds of interesting adventures. Dual Enrollment students worked with the concept of light and shadow with this assignment. It was fun to see them experiment with different ways to capture the light in their camera and how it impacted their final images. We are now moving onto their final thematic series to finish out the course. Sarah used a slower shutter speed to capture this view from the second floor of the GRAM during the MAEA Region 9 show. Kenton used a faster shutter to capture this moment of the stream of water frozen in space. Tara uses panning to show movement of her brother. Denise used a slower shutter speed to paint with light in the background of this figurine of Lady Liberty. Holly used a slower shutter speed, a timer, and a tripod to capture this self portrait in motion. Jason used a slower shutter speed to create this image. I am very excited that I have the opportunity to teach Dual Enrollment classes through Kendall College of Art and Design. This semester I am teaching students an Introduction to Photography course where they will learn a variety of ways to capture images. Our first assignment was all about perspective and point of view. The results offered a variety of solutions that showed new aspects of the everyday. In addition to formal assignments, I have been giving students challenges that help them better apply the concepts being discussed during class lecture and in the reading. We had two snow days in the last week, so I challenged students to take pictures that characterized the snow. Here are two examples of the types of images students made when they were stuck home from school due to the snow days. In addition to teaching 7th and 8th grade Art, I also have the unique privilege to teach Dual Enrollment courses for Kendall College of Art and Design. This semester I am teaching Intro to Photo for Non-Photo Majors. It is a digital photography course that will acquaint students with the fundamentals of using a digital SLR camera and composing a quality image. We are currently working on a project dealing with the concept of perspective and point of view. Students can make any type of image they like, with the emphasis on breaking away from traditional habits of centering images or only using standing eye view. After today's lecture on lenses and focal length, as well as a process critique of select images taken, students were asked to play a game - a seeing game. Having only 30 minutes, students went around the classroom and hallways of the school to take pictures of objects in ways that resembled letters to their names. It was fun to see students search out letters and try unusual methods to solve this design problem. I am particularly proud that this mini-lesson was inspired by one of my students.